On game day what's better than a bowl of hearty chili? Whether you are tailgating, at a sports bar or chillin' with friends this dish hits the spot. 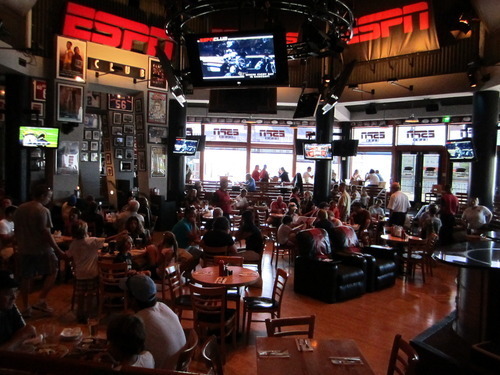 It's a big sports day and your at Walt Disney World, well there is only one place to go to get grub and watch the game, ESPN Club at Disney's BoardWalk. A fan favorite is their chili and you can now make it at home. Mix all dry spices well. Place cubed sirloin into a mixing bowl; add dry spices and mix well. In a large saucepan, heat the cooking oil, add the diced onions sauteing until lightly browned; add the garlic, continue cooking for 5 minutes. Add the ground beef, cook until meat is cooked through, then drain off the fat. Return to medium heat; add the seasoned beef sirloin, peppers, celery, V-8 juice and tomato products. Cook for approximately one hour or until the beef is tender.Serve.